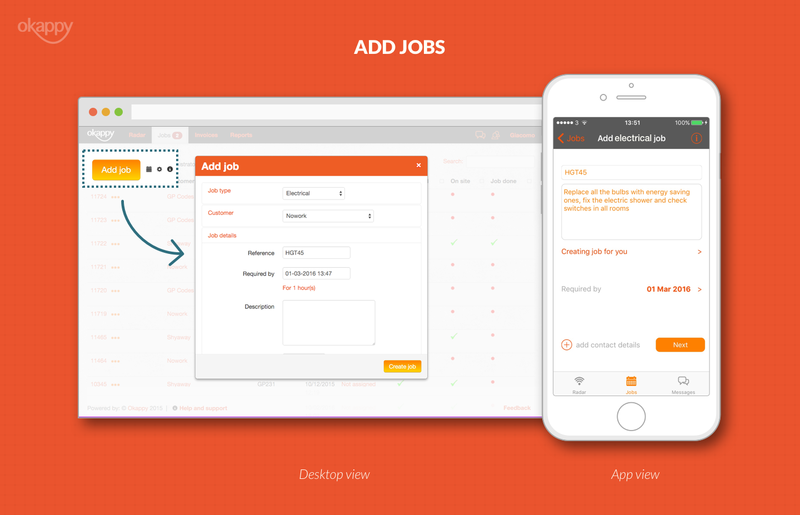 Okappy is an easy to use job management app available on all devices. Add or receive jobs, allocate them to your employees or subcontractors then watch their status change in real-time as the jobs are updated in the field. 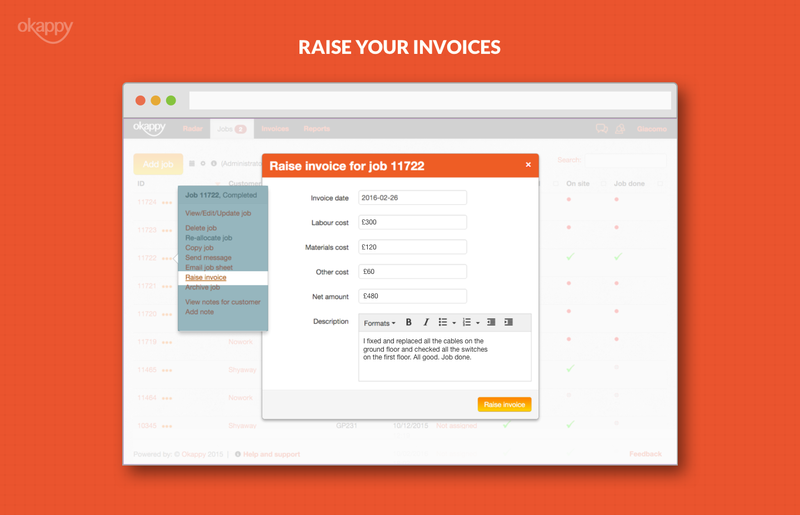 Raise your invoices at the click of a button as soon as your jobs are complete. No more missing paperwork, no more lost or incorrect invoices and no more stress and anxiety trying to find out what is happening with your jobs. Get a real-time view of your cash flow, anytime, anywhere on your Mac, PC, tablet or phone and see up-to-date financials with Okappy and Xero Accounts. Like Okappy, Xero is designed for small business with accounting software that’s simple, smart and beautiful. Combining Okappy with Xero allows you to export your invoice to Xero providing a complete business solution from worker and time tracking, job management and job costing through to tax returns, profit and loss, payroll and fixed asset reporting. Create your invoices effortlessly in Okappy using our simple web and phone based job management software. Save time and money, reduce stress and eliminate paperwork. 1 Create your job in Okappy, or receive a job from a customer. 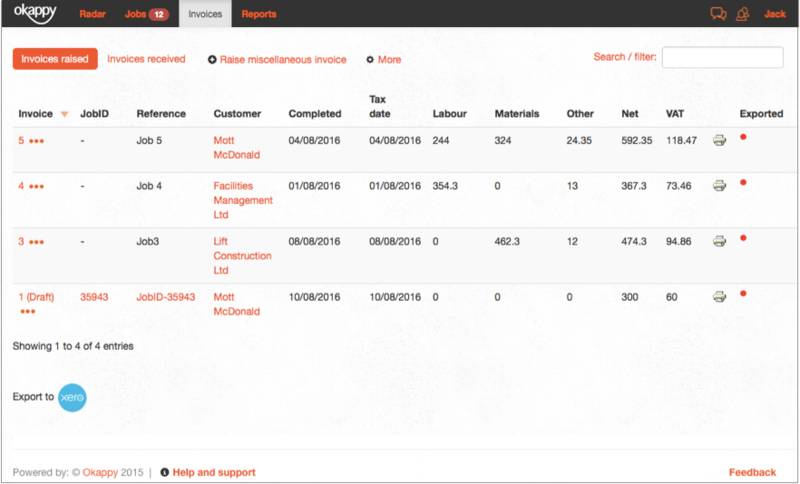 2 Once your engineer has completed the job, you can raise your invoice at the click of a button. 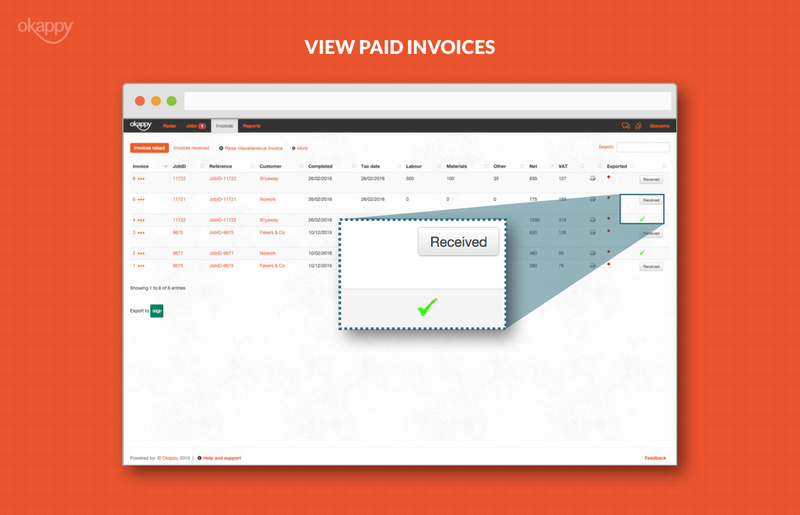 3 Your customer can see their invoice in real-time and make the payment there and then. 5 Reconcile your accounts, complete your financial returns and check your financial position. Xero is an easy-to-use online accounting software that’s designed specifically for small businesses. It’s all online, so you can work when and where you want to. Just login with your PC, Mac, smart phone or tablet. Xero has all you need to run your business – including invoicing, paying bills, sales tax returns and reporting. Find out more about Xero Accounting Software.